You’re experiencing jaundice, abdominal pain or constipation. And by then, you may be too late. Pancreatic cancer symptoms often arrive after the cancer has already spread, making the disease one of the leading causes of cancer deaths in the U.S. However, a team of researchers believes that targeting how blood clots form and are naturally cleared could make the cancer more treatable. A multi-university team is studying the link between blood clots and pancreatic cancer using this tiny simulation device. The team – which includes researchers from Purdue University, the Cincinnati Children’s Hospital, the Indiana University School of Medicine and the University of North Carolina School of Medicine at Chapel Hill – is studying the relationship between clots and pancreatic tumors in both animal and human tissue samples through the support of a $4 million grant from the National Institutes of Health. What the team finds could lead to improved therapies for patients suffering from pancreatic tumors. "Pancreatic cancer promotes blood clot formation, and then these clots make the cancer develop faster, which prevents drugs from controlling tumor growth," said Bumsoo Han, professor of mechanical engineering at Purdue University and program leader of the Purdue University Center for Cancer Research. "Our idea is to study this process by use of engineered tumor models mimicking the pancreatic duct," he said. The project is based on the initial findings of Matthew Flick, a member of the faculty at Cincinnati Children’s Hospital and former Ph.D. student in biological sciences at Purdue, that pancreatic tumors and blood clots are linked through bi-directional mechanisms that promote both pancreatic cancer growth and blood clot formation. Han’s group built a tiny device with “microfluidic” channels that host pancreatic duct tissue samples beneath a microslide. The device takes information from these samples to simulate with greater detail how cancer develops from the pancreatic duct and invades surrounding tissue. 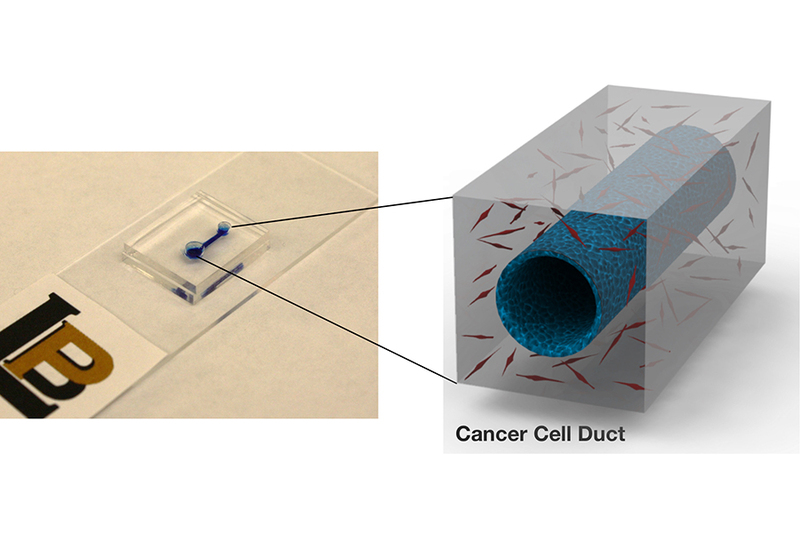 The microfluidic device will assist in defining key mechanisms of pancreatic cancer growth and blood clot formation. Validation studies will be performed by Flick’s group to confirm tumor growth findings in mouse models, while Melissa Fishel’s group at the IU School of Medicine and Melvin and Bren Simon Cancer Center will perform the same using patient samples. Alisa Wolberg’s group at UNC Chapel Hill will further validate identified mechanisms of cancer-driven blood clot formation in animal and patient samples. Each member of the team is contributing equally to the project. The NIH grant will facilitate future work on the study of these mechanisms and translation of the findings into new treatments. A patent has been issued for the microfluidic device technology.